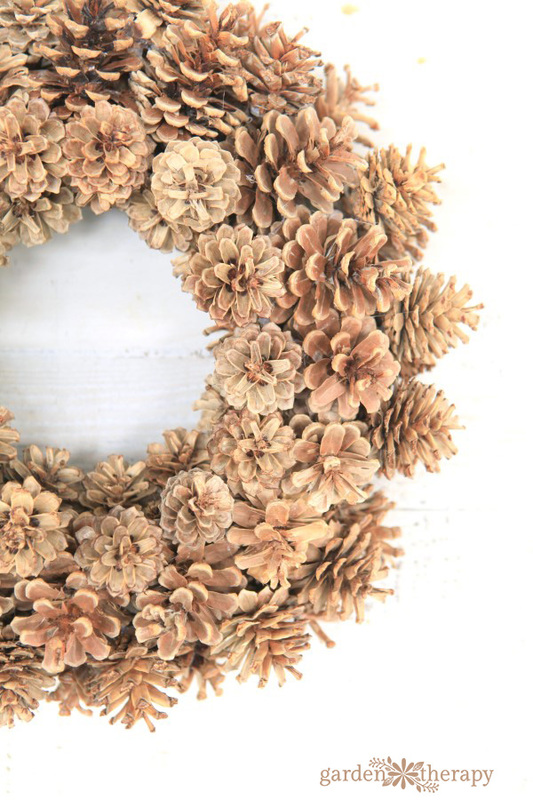 This gorgeous bleached pinecone wreath has rustic charm with a contemporary twist. There is nothing like natural decor to bring the beauty of the outdoors in, but it can be hard to come up with creative ways to display the same natural elements year after year. That’s why I love the look of bleached pinecones, which are simultaneously classic and modern. 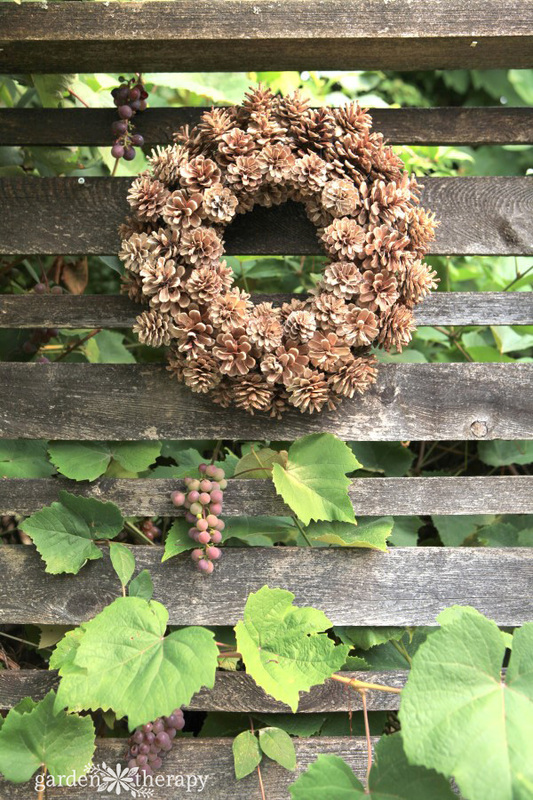 With just a few easy steps, you can create your own bleached pinecone wreath to enjoy throughout the colder seasons. Bleached pinecones are all the rage! While pinecones have always been a staple of autumn and winter décor, bleaching them gives them a softer, brighter, more contemporary look than untreated pinecones. The light color also creates a contrast and makes the interesting shapes of the cones really stand out. We have seen single bleached pinecones displayed in glass terrariums, groups of them piled into decorative baskets, bleached pinecone garlands, bleached pinecone ornaments with ribbon hangers, and this gorgeous bleached pinecone door swag. 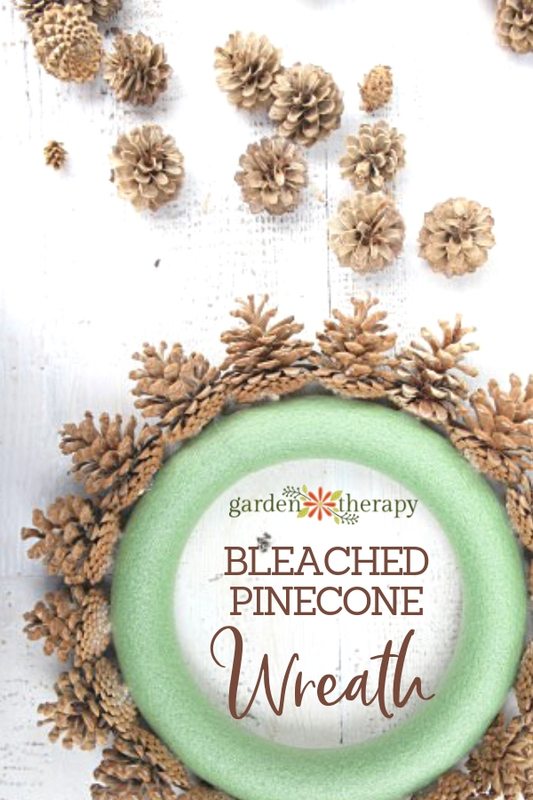 But this bleached pinecone wreath project really captured our hearts here at Garden Therapy (you know how much we love wreaths). 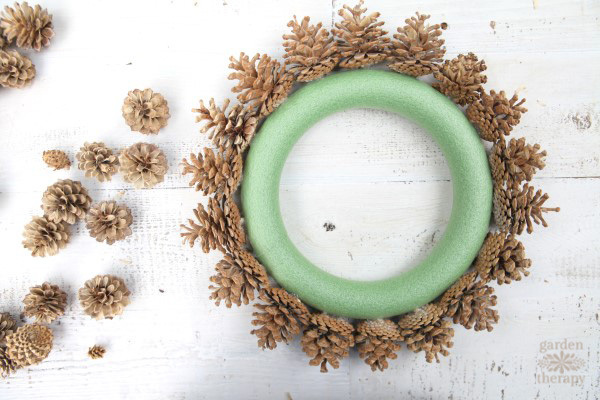 This wreath is the perfect way to adorn your entrance this fall and winter. 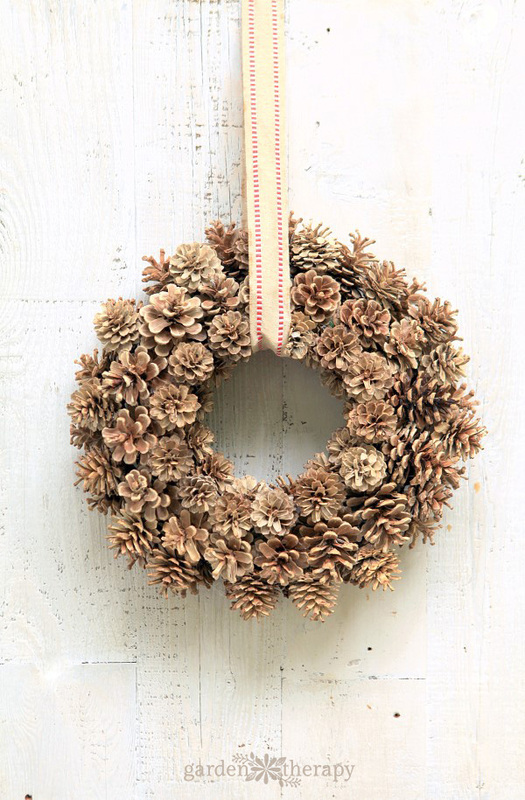 It has a rustic farmhouse look, but the surprising white color of the pinecones gives it a modern, minimalist feel. And the best part? It is super easy to make! Begin by taking a walk through a park, wood, or tree-lined street and pick up a whole bunch of pinecones. Follow the instructions for bleaching the pinecones here, and then you are ready to begin your wreath. 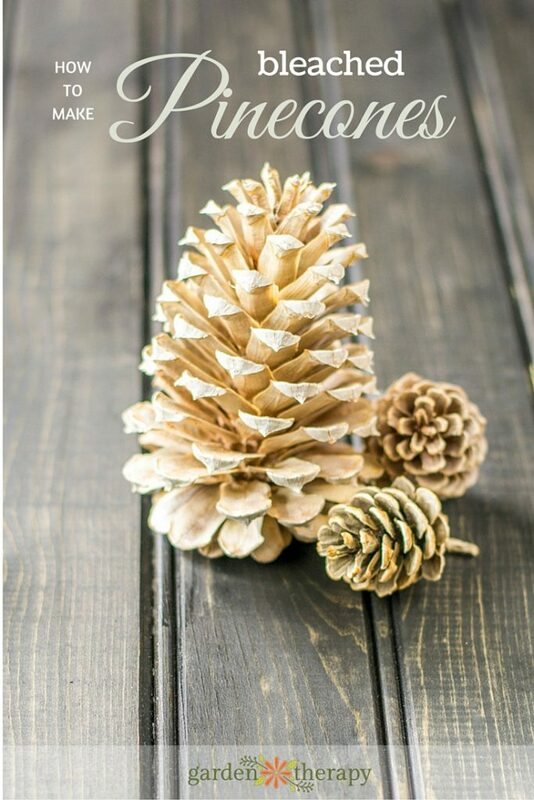 Divide the pinecones into different sized groupings so that you can choose between medium and small ones for each layer. 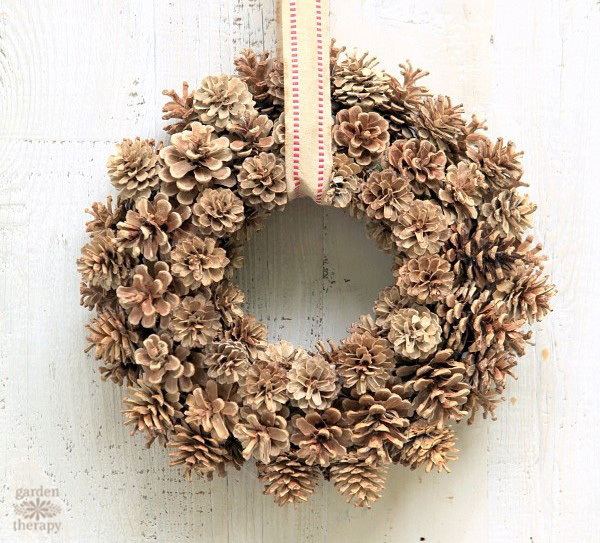 Lay out medium pinecones around the wreath form, with the base of the pinecones touching the wreath. Use professional strength glue to attach the first one to the base. 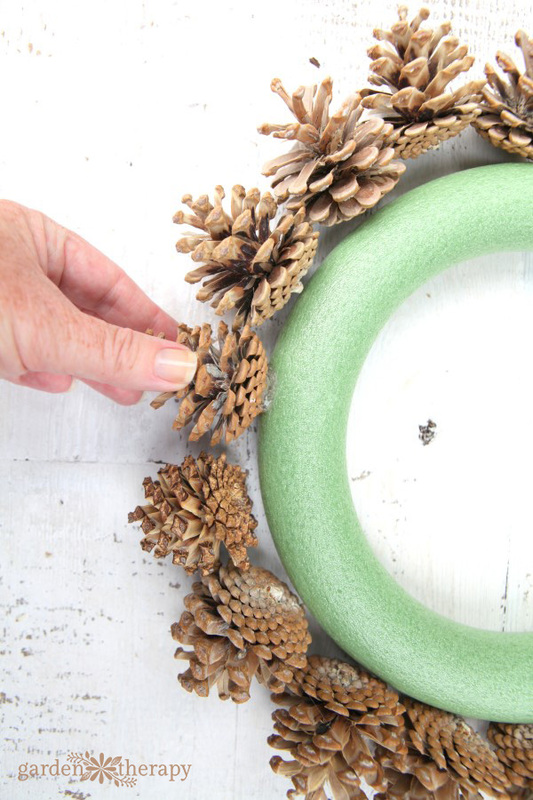 Add glue to base of the second pinecone and knit the second one into the first one as you attach the base to the wreath form. 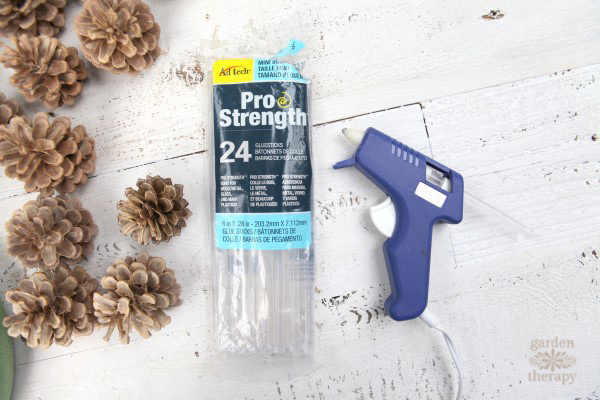 Continue to glue the base of the pinecones onto the outer ring of the wreath form while knitting them tightly together to fill up the spaces. Lay out the inside ring of smallest pinecones. 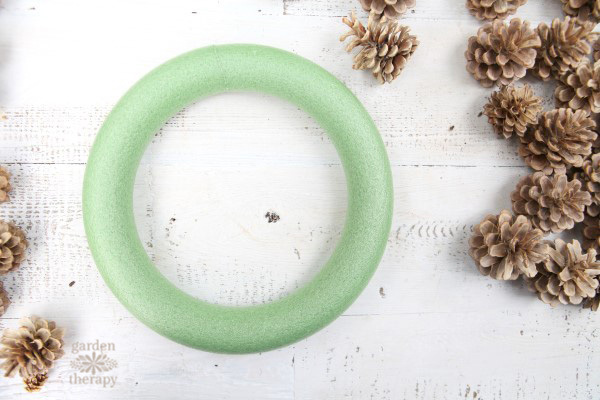 Attach those to the inner ring as you did to the outer ring. Add a third layer of medium sized pinecones alternating between the first ring. Nestle these in as close to the other pinecones as you can, while gluing the base to the wreath form. Add fourth and fifth rings to fill in the gaps between the layers and fill in all the spaces. but it’s also at home in the garden. Which do you like better? 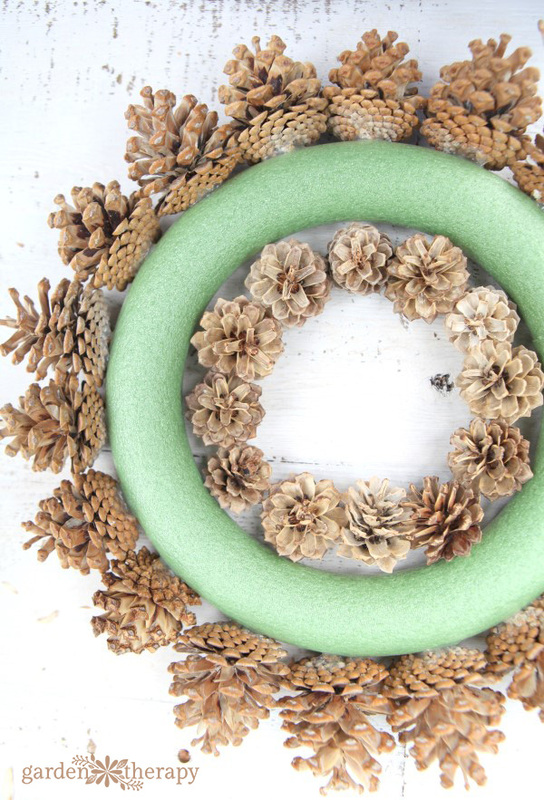 Love this wreath? Well, here are a whole bunch more! I’m so glad you found a way to have one! The first row is on the outside of the ring, the second row is on the inside of the ring, and rows three and four fill in between them. Look closely, you can see them! Have fun!